The other day, I drove into Manhattan on Saturday morning and headed to a block that, in the past, I’ve had good luck finding on-street parking. But not this time. Because, apparently, since my last time here, a big swath of curb space had been allocated for Citi-bikes. Despite the inconvenience of an extended parking search, I was happy to see the city giving up parking spots in favor of bikablity. I am always on the lookout for examples of how walking and biking are supported. So I was delighted to learn that our own Bloomfield Train Station is about to get a great bikability upgrade. It’s called a Bike Depot and, according to this month’s NJ Bike&Walk Coalition newsletter, it’s slated to be operational next month. 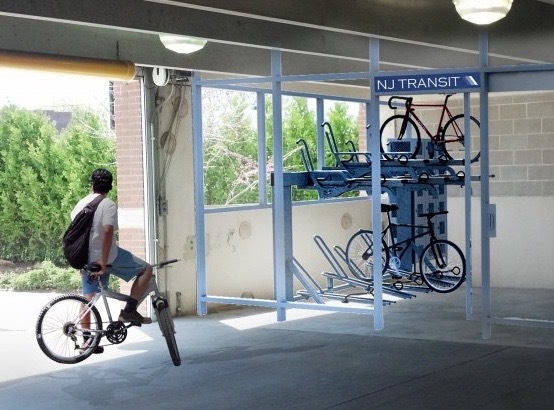 We already have a Bike Depot in the parking garage of the Bay Street Train Station in Montclair, and for many it has been a game changer. A portion of the garage is reconstructed to securely store bikes while their owners are away. Aside from keeping the bike safe and dry, there are also lockers where riders can stash bike shoes or helmets. The Bloomfield Station Bike Depot is going up in the Glenwood Garage in downtown Bloomfield, so members can use it for commuting or while they’re shopping. Of course, I’m waiting for the day that every train station in the area has a section devoted to bike parking. But my habit of choosing to walk or bike over driving whenever I can has made me more patient overall.